These all-new Allavino FlexCount Series Wine and Beverage Centers offer the best of both worlds for anyone that wants some extra storage space for beverages while also having a place to store wine in it's optimum conditions. 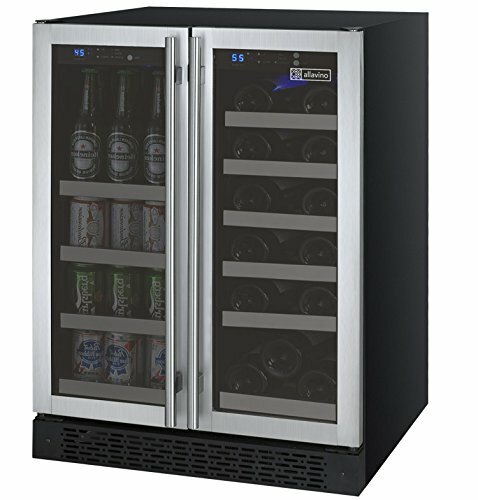 Independently controlled temperature zones allow you to keep your beverages frosty cold while ensuring that your wine matures at the proper temperature, and interior fans circulate the air inside of the unit for even cooling and faster cooldown times. Every bottle and can is safely stored on Allavino's innovative new FlexCount shelving, which has been specially designed and constructed from durable metal to be thin enough to provide more space between shelves than other similarly sized wine cellars, making the most of it's convenient compact size. STORE WINE AND BEVERAGE SIMULTANEOUSLY: Finally, you no longer have to decide between owning a wine refrigerator or a beverage center! Keep your beverages frosty while aging your wine properly at warmer temperatures. Both sides can be individually controlled using one of the intuitively designed control panels with clear digital displays and user-friendly push button controls, making setting and monitoring temperatures a breeze. INNOVATIVE NEW SHELF DESIGN: Allavino is at the leading edge of shelf design, utilizing revolutionary metal shelves that are strong enough to support the weight of bulk storage without sagging, yet thin enough to maximize the available space in the cabinet for storage. Wood slats on the wine shelves gently cradle each bottle to prevent harmful vibration from affecting your wine. The beverage shelves feature a textured surface that prevents bottles and cans from sliding. STORE MORE BOTTLE SIZES: The intelligent design of these shelves creates more space between each shelf, allowing you to store bottles with varying diameters without having to remove racks and reduce your overall capacity. Due to the smart spacing of the shelves in the beverage side, you are not limited to storing cans or laying tall bottles on their sides. These shelves glide out smoothly on ball bearing tracks, so nothing in your assortment is out of reach! POWERFUL COOLING TECHNOLOGY: Thanks to a new 25% more energy efficient advanced cooling system, these wine and beverage centers deliver powerful cooling while reducing noise and vibration and saving you money on your electricity bill. Interior fans circulate the air inside of the cabinets for even cooling and faster cooldown times, helping to prevent drastic temperature fluctuations that could harm your wine. BUILT-IN OR FREESTANDING USE: Their front-venting design allows these wine and beverage centers to fit seamlessly between cabinets, while their finished tops and sides give you the option to use them as stylish freestanding units. They come complete with both curved and towel bar handles, so you can select the look that best fits with the surrounding decor.